This clear glass clock seemed like the perfect project to bring an unexpected touch of the most wonderful TIME of the year to our home. etchall® products made it easy to transform this plain clock into a special home decor piece. 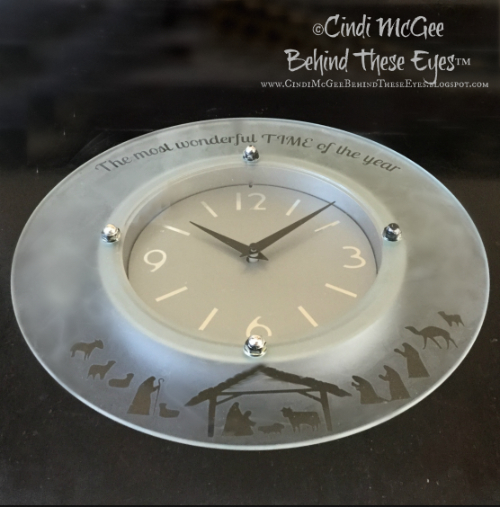 I began by searching the internet for silhouette nativity scenes and then selected elements to use for the scene on the clock. Each image was arranged to form an arc to fit the bottom of the clock. The text for the top was also arranged to form an arc for the top of the clock. The font I chose is “Lobster Two”. Once these two elements were ready, I created .png images of each and removed the background area then imported them into my electronic die cutting machine software. Each was sized at approximately 8” across to fit on the desired area and cut from etchmask®. After weeding the excess etchmask, the transfer paper was used to transfer the images ot the clock face. 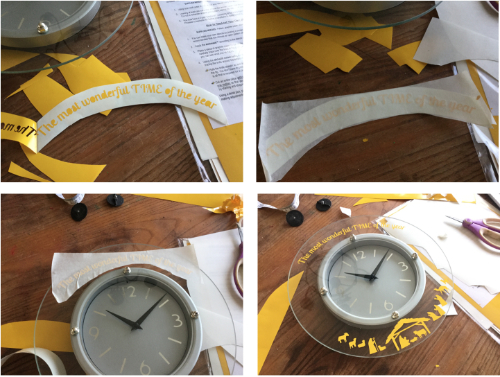 Create a circle from the etchmask to cover the area where the face of the clock is. I found a bowl that was the same size and traced it. 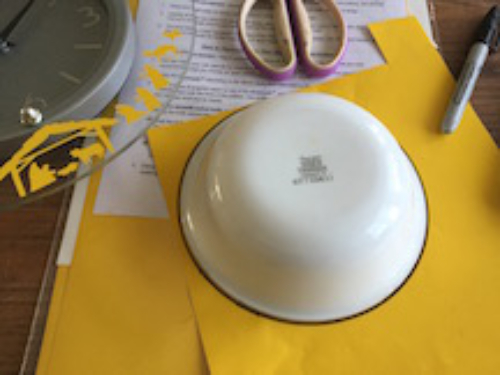 Place the center mask onto the clock. Unscrew the nuts holding the glass to the clock and remove the glass. Use the squeegee to apply a thick coat of etchall Créme to the glass. Let set 15 minutes. Use squeegee to return creme to the bottle. etchall Créme is reusable! Wash the glass thoroughly and remove the etchmask. Let dry. Re-attach glass to the clock.